Gonda, in Uttar Pradesh, has been ranked the dirtiest city in the Swachh Survekshan 2017. Scoring 434, the city is at the bottom of the Swachh Bharat survey. With a population of only 1.15 lakh people, less than most towns and cities surveyed, Gonda generates nearly 54 metric tonnes (MT) of waste every day – a manageable amount. The city is spread over 42.06 sq km. People here are forced to dump garbage in empty plots, abandoned houses, parks and ponds due to the absence of sanitation workers. When there is no proper place to dump, they use open drains to make way for the solid waste. This chokes the drains and results in sewage backflow. No wonder that Gonda scored a zero on the ‘solid waste processing and disposal’ parameter. But an employee of the municipal office tells a different story. On the condition of anonymity he reveals that in the last 10 years, the council has not purchased a single item required for cleanliness. “Be it dumpers, loaders, garbage carriers or equipment required by safai workers, nothing has been purchased. Some of the vehicles bought 10 years back were not even registered and have been left to decay in the waterworks premises,” he says. Singh, on the other hand, is confident that the situation in the city will improve soon. “You see, it is not a big task to clean the city. It is not in as bad shape as was projected in the survey. I have taken charge recently. I hope things will start falling into the place October onwards. I am sure you will not see Gonda in the last few cities in the ranking next year,” he claims. He avoids the question on the amount of tax revenue and grants (under the Swachh Bharat) received by the council for the current financial year, by saying that he has joined recently and doesn’t have the updated records. Regarding the steps being taken for sewage network in the city, he says that there is no need for it due to less population. Outside Singh’s office, several people, who are neither the workers of the municipal office nor the applicants or visitors, are sitting on large benches. Locals say that the municipal office has become a hub of agents and quacks. “You have to go through them if you want to get your work done or meet any official,” one of the residents informs me later. Surprisingly, the municipal council has been functioning headless without a chairperson (also known as a mayor in many cities) for the past three years, after the last chairperson’s powers were seized following financial irregularities. In the absence of a permanent head of the council, there is no accountability and several irregularities run in the attendance of the employees. “There are two sanctioned positions of sanitary inspectors, out which one position is vacant and another person remains absent on medical grounds. Similar is the situation when it comes to safai workers. Most of these people have kept ghost workers and are working incognito,” says Ved Prakash Shukla, ward corporator. Moreover, “There is no people’s participation at all. The house has met only thrice in five years. How on earth are we going to tackle any problem pertaining to sanitation?” he asks. Was Gonda always like this? Till the late 1980s, Gonda was entirely dependent on manual scavengers for cleaning household latrines on a daily basis. The latrines, including those in well-to-do households, were built on high platform in the backyards. Between 9-10 am, a person, mostly from a low caste, would come and collect the human excreta from the bottom of the platform. At a time when many other places in the country were switching to improved toilets and eliminating manual scavenging, Gonda was nowhere moving in the direction of improvement graph. Later, in the 1990s, households in the city switched to modern toilets. The backyards from where manual scavengers would enter the house were shut and the same toilets were connected to septic tanks and drains flowing outside the houses. However, the municipal council didn’t come up with any measure to stay tuned to this changing pulse. The city felt the need for a sewerage network but the administration did not. As a result, at present, human excreta continues to accumulate in the already clogged septic tanks, while other liquid waste from each house flows into the open drains. The entire city is contoured with thin and thick drains outside every house, carrying municipal sewage to bigger drains and ponds. Over the years, most of these drains have been encroached upon and blocked by new construction. The result: clogged drains, which serve as a breeding ground for mosquitoes in most of the localities. 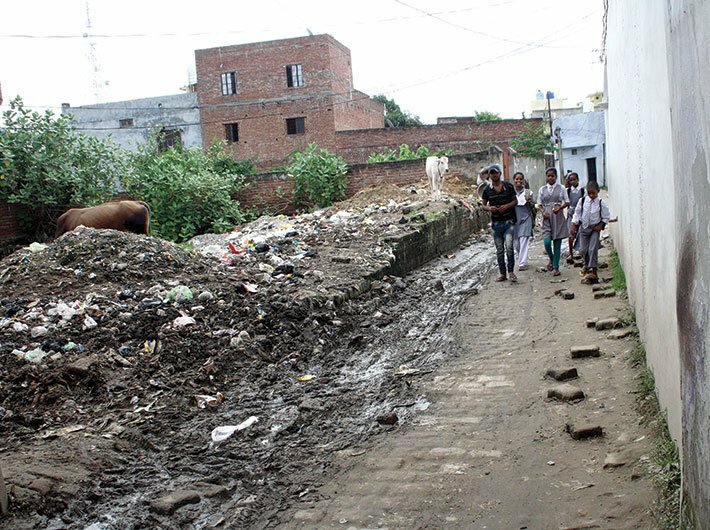 Three years back, prior to the Lok Sabha polls, the city’s civic body sent a proposal to the UP Jal Nigam for setting up an underground sewerage network, only to be ignored. Meanwhile, a significant number of people living in the city defecate in the open. A total of 1,806 individual household toilets are required within the city periphery. The municipal council was able to provide 400 toilets only. The municipal council received a total of Rs 4.46 crore as revenue in the form of various taxes in 2016-17, as per its budget document. In the same financial year, a total of Rs 3.07 crore was given to the city under Swachh Bharat and AMRUT (Atal mission for rejuvenation and urban transformation) missions. However, the council has spent only Rs 49.6 lakh on cleanliness and sanitation as listed in its annual budget. “There is no concept of dustbins or garbage bins. Some garbage bins were installed in 2014 after the Swachh Bharat Mission was announced, but all are either damaged or overflowing. Even schoolchildren wade through the garbage littered all across the lanes,” says Prem Krishna, a shopkeeper from Golaganj, Chowk area. “We are sitting on a pile of diseases. All the actions like fogging, disposal of waste and street sweeping are done through personal volunteering. We even spend our money on these things,” he adds.